- Tingles and Sweetest Kisses. Smooth and silky, these bars are rich and moisturizing for your hands and skin. There seven different fragrances to choose from. They also come in a convenient twist tube for easy portability. Mela Tae is Irish for tea bag. But these aren't just any tea bags. They're filled with herbs that help soothe your eyes, refresh your hair, or rejuvenate and deep clean your face. Loving the great outdoors? But sometimes it doesn't love you back. Here's where you'll find our Gardener's Salve for us gloveless, hardworking gardeners, Dó Gréine Spray which alleviates painfil and itchy sunburns, bug bites and more; and our Sore Muscle Rubs that are as pleasingly fragrant as they are muscle soothing. Are you a showers or bath person? We've got fragrant, exfoliating and moisturizing options for both! For the bath we have Bath Salts or discover the skin satisfying power of Bath Vinegars. Sugar Scrubs are energizing exfoliants for bath or shower! Ceo Brionglóid (Dream Mist) linen sprays provide a wonderful scent to linens, pillows, clothes - even you! These scents will guide you to a lovely nights sleep with wonderful dreams. There are five scents to provide the anytime aromatherapy burst you need. Your face deserves a little extra loving. Tone and cleanse to a lovely and gentle glow with our Face Toner and Honey Pumpkin Face Mask. 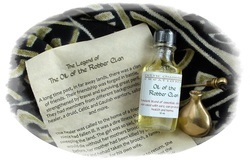 An amazing essential oil blend with legendary uses.